Since the US Supreme Court legalized homosexual "marriage" (no one can actually redefine marriage because God is the one who defined it), religious persecution has been on the rise, as was predicted by Franklin Graham and others; say that homosexuality is a sin and not something to be celebrated, risk getting in trouble. The court has been wrong in the past (abortion, the Dred Scott decision, and others), and is wrong now. Kim Davis, a county clerk in Kentucky, refused to issue marriage licenses that would violate her religious convictions. She went to jail, which was a violation of both the United States Constitution and the Kentucky Constitution. Indeed, the tinhorn activist judge who sent her to jail also required reeducation of students who opposed homosexuality. Naturally, the Gaystapo, unintelligent atheists, and other leftists are thrilled with all this, not caring about the implications that state and federal laws are being violated. No, it's more important to advance the gay agenda and hog tie "religious" folks. These are the kind of people who would kick a fresh cow patty on a hot day. 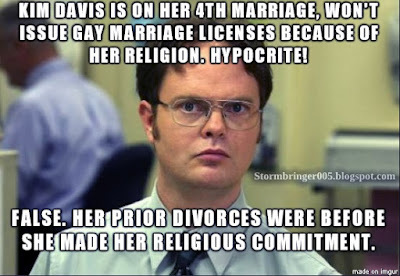 One of the hate remarks is summarized in the picture above, that Kim Davis is on her fourth marriage, so she has no right to complain or stand up for her convictions. Sanctity of marriage? 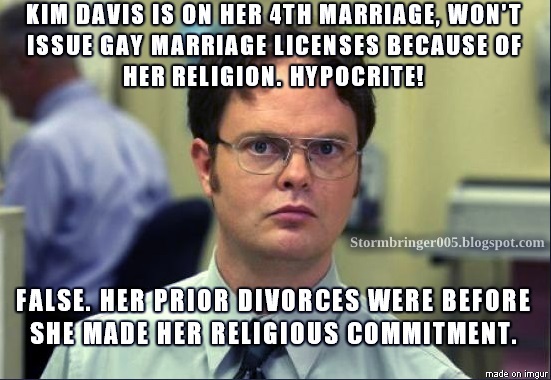 She's a hypocrite since she's had so many herself, so why complain about homosexuals wanting marriage? Narf! Nice superficial straw man there, Poindexter. The fact is, she made her religious commitment after her divorces and fourth marriage. Take a look at "Top 10 liberal lies about Kentucky clerk Kim Davis". Follow me as we ride along this here side trail now. We believe, as explicitly stated in the scriptures, that there is only one God (Deut 6:4). He is the Father of all creation (Malachi 2:10). He was manifested as the Son for our redemption (Isaiah 9:6, Matt. 1:21-23) and is dwelling in the lives of the believers as the Holy Ghost (Colossians 1:27). We preach the Bible as our roadmap to heaven. The plan of salvation that the apostles preached is the same plan that we preach (hence the name “Apostolic”), which is repentance, water baptism in the name of Jesus Christ for the remission of sins and the gift of the Holy Ghost (Acts 2:38, 8:16, 10:48, 19:5, 22:16, Col. 3:17, Eph. 4:5). Although they list several Bible verses, they are twisted and taken out of context. This church is listed in the Apostolic Churches directory, which has several major flaws in its beliefs section. As I said, Rock Solid believes modalism, but also insist that water baptism is necessary for salvation, which is false. The Apostolic Churches also believe in the unbiblical doctrine that you must speak in tongues to prove you're saved. Both of these are adding works to faith-based salvation (Ephesians 2:8-9). In addition, the "apostolic" churches are unbiblical, divisive, and cultic. To learn more, I suggest checking out Holly Pivec's "Spirit of Error" and these two interviews with her. Also the articles, "What is the New Apostolic Reformation?" and "The Apostles Who Don't Do Anything". This brings me to something that will irritate some folks. That is, Kim Davis is deeply religious, but if she's accepting the false teachings of this group, then the Jesus she believes in and her religious convictions are not based on a proper understanding of the Bible. She would then need to repent and believe in the real Jesus of the Bible, and accept the biblical understanding of the nature of God. Now let's rejoin the main trail we were riding and reach our destination. Do I support Kim Davis because she's a sister in Christ? No, because I do not believe that she is. Should I join with others in supporting her for upholding her religious convictions? You betcha! Listen up, cow-patty-on-a-hot-day-kickers as well as decent people. Myopic atheists and leftists should be supporting her as well because of the blatant governmental violations of free speech, religion — and thought. Just because someone doesn't agree with the views of someone else doesn't mean they can't uphold the bigger principles at stake. Update: She has been released from jail. Let's find out what happens.